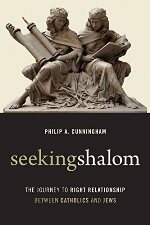 This collection of thirteen essays by Philip A. Cunningham, arranged in two sections (“Scripture” and “Theology”), on how a “right relationship” is develop-ing between Catholics and Jews is informative and useful. All but one chapter are based on or adapt previous writings and lectures, though all were composed in light of the 1965 breakthrough statement of the Catholic Church, Nostra Aetate. Cunningham’s fifth volume on the theme of shalom, Seeking Shalom demon-strates that the changes brought about fifty years ago and subsequently through church statements and the results of dialogue and scholarship can allow Chris-tians and Jews today to dwell in shalom—well-being, in right relationship within their communities, and with one another. It is a superb resource for teaching Catholics and other Christians about their relationship with Jews, for presenting this information to Jews and all interested readers, and for assisting Christians in reading the scriptures in light of biblical scholarship since Vatican II and the achievements of NA and subsequent documents and statements on relations be-tween Jews to Christians. Readers will find that the first seven chapters, under “Scripture,” provide les-sons on how a renaissance and growth in biblical scholarship for Catholics was necessary for shaping more constructive teachings on relations with Jews. Cunningham begins with the 1943 encyclical of Pope Pius XII (Divino Afflante Spiritu) and its influence on the Vatican II constitution on revelation (Dei Verbum), and then turns to the continuing work of the Pontifical Biblical Commission, especially its statements in 1964, 1993, and 2001. Cunningham nicely balances a discussion of achievements in biblical understanding with ex-amples of reversals of negative teachings about Jews. He employs models from biblical scholarship, such as the three stages in the development of the gospels (the ministry of Jesus, post-resurrection apostolic preaching, and the writing of the gospels), and the four options for incorporating Gentiles in first century Christian communities (pp. 84-85). Cunningham draws attention to a diversity of situa-tions and themes, especially in the writings of Paul and the gospels. He provides information on the history of the apostolic and post-apostolic periods, drawing on new insights from scholarship on the gradual parting of the ways between an emerging Christianity and Rabbinic Judaism (with each perhaps influencing the other). Throughout his narrative, Cunningham cites papal teaching from Paul VI, through John Paul II and Benedict XVI in large measure, to Francis, as well as statements of key church officials responsible for relations with Jews and the published work of scholars. Under “Theology,” Cunningham traces in six chapters how NA was truly a “new” beginning and a reversal of past teachings, and explains how church teach-ings have built upon its message, including the need for a retelling of the Christian story. Cunningham addresses complex theological issues, such as how both Jews and Christians—despite their differences—covenant with the one triune God, and how biblical texts influence Jewish views of the land and State of Israel and how Christians might address these realities. His section on Pope Fran-cis (pp. 177-78), though brief, is significant for future steps. In a final chapter and a conclusion, Cunningham addresses the overall rapprochement and unexplored mutuality between Christians and Jews. He returns to the fundamental question Jews raised during Vatican II about whether a relationship with Christians is pos-sible, and argues that it is. Cunningham’s suggestions are thought-provoking and challenging on topics needing fresh thinking. His reflections on mutuality are helpful to all interested in dialogue. Some points need correction or emendation. Pope John XXIII did not man-date that Cardinal Bea “prepare a draft declaration” of NA in September 1960 (p. 145). That date would have been far too early. Only in February 1962 did the Pope approve Bea’s request for his Secretariat for Promoting Christian Unity to prepare its own draft; previously Bea and the Secretariat had been engaged in preliminary studies and had made recommendations to other preparatory bodies. Although evidence shows that from June 1960 onward Pope John never gave up on promoting Jewish relations, so many uncertainties with regard to the preparations for the council and the unfolding four years of deliberations demonstrate how phenomenal NA truly was. Also, Cunningham’s brief paragraph on how the eventual expansion of NA “weakened the text’s stress on the unique relationship between the church and Judaism” is misleading (p. 146). Cardinal Kasper’s ob-servation that this was done to save the substance of the text, the furniture in a burning house, only partially describes the situation in October 1964, the critical month for NA’s survival. The opposition sought to split up the draft, scattering the pieces in other council drafts. The text was expanded not just to save it from de-struction or to appease critics but also to incorporate legitimate proposals and initiatives that grew out of the conciliar process itself. Bea came to agree that the various parts fit well together while the central teaching on Jewish relations showed more brightly in contrast but in relation to the other sections. Cunningham puts too much emphasis on patchy archives of the “hidden encyclical” of Pius XI, which was never issued (pp. 142-45). In 1939, the church was not ready for NA’s message. The details of why that was so make the im-portant story, not what might have been the paragraphs of an early draft. Moreover, Cunningham writes that prior to NA “there had never before been a defining ecclesiastical statement about the church’s relationship with Judaism” (p. 179). However, while perhaps not specifically intended to be “defining,” there are plenty of references to Jews in previous conciliar texts. As conciliar texts, they were authoritative. Also, in a discussion of the land of Israel, Cunningham gives too little attention to the experiences and views of Palestinian Christians historically and theologically (pp. 220-21). Finally, a very minor correction: Cunningham refers to the council as a conclave, which it was not (p. ix). It is disputable when the trajectory that led to NA 4 begins. Did it start with preparations for Vatican II (p. 141)? Are its roots earlier, in the three decades prior to the 1960s, as J. Connelly suggests in his book From Enemy to Brother: The Revolution in Catholic Teaching on the Jews 1933-1965 (Cambridge: Harvard University Press, 2012) (cited on p. 54)? I opt for Connelly’s earlier date, when Catholics, often converts from Jewish or Protestant origin, and some Protestants began to oppose vigorously racist antisemitism. Despite these criticisms and disputes, mostly about the history of NA, Seeking Shalom is an impressive collection of reflections by a scholar who has dedicated years to improving relations between Christians and Jews based on accurate information, sound biblical research, and careful theological attention to the implications for both Christian and Jewish teaching. Overlapping material and repetition make this a helpful guide for catechesis. Unfortunately, there is no index. Source: Studies in Christian-Jewish Relations, Vol 11, No 1 (2016); this work is licensed under a Creative Commons Attribution 4.0 International License. John Borelli finished his doctorate in the history of religions and theology in 1976 while teaching full-time. After 11 years of teaching in New York, he accepted a position with the National Conference of Catholic Bishops, promoting ecumenical and interreligious relations. Since 2003, Borelli has been at Georgetown University where he teaches, manages conferences, coordinates dialogue and mission for the Jesuit Conference, facilitates workshops, and promotes university relations with offices and institutes of the Holy See.